Paisley is very fortunate to have had a rich and interesting history in our town, indeed the surrounding area has been at the heart of Scottish History for hundreds of years. Paisley is a large town situated 7 miles (11 km) W of Glasgow, and 53 miles (85 km) W of Edinburgh and is the largest town in Scotland. The town grew up around Oakshaw, on the west side of the White Cart river, where a Roman fort may have existed. Its growth in the early 19th century was primarily through textiles (printing, bleaching, cotton thread) and the name ‘Paisley’ was given to the Kashmiri pattern of curving shapes found on silk and cotton fabric. Notable buildings include the Paisley Town Hall (1879-82), Paisley Museum and Art Gallery, the Coats Observatory (1883), the John Neilson Institution (1849-52), Stanely Castle (15th century, in the Stanely Reservoir to the south of the town), the Sma’ Shot Cottages and St Mirin’s Roman Catholic Cathedral. If you have anything for the Paisley history section please use our contact page to send it in. The earliest records which mention the growing village on the river Cart call it Passelet, Passeleth, or Passelay. In the sixteenth century we find the name Paslay or Pasley. During the eighteenth century it took the form Paisley, as we know it today. What does it mean ? No one is quite sure. two popular suggestions are “moist pasture-land”, which certainly describes the countryside around Paisley, and “flat stones”, which could refer to the rock ledge at the Hammills. We have gone from a predominantly farming community to that of a weaving town serving the cities of Glasgow and Edinburgh and though the farms around us are still very important we fear that the rich heritage left to us by the generations before should be fought hard for. The sections, accessed through the buttons on the right, will provide you with a good insight of what life was like in the by gone years. The Photo History will allow you to compare the town now with the town then while Rich History gives insight to the times when cars had never been heard of. My Toon, on the other hand will tell you of the recent history of the town through those who lived it. 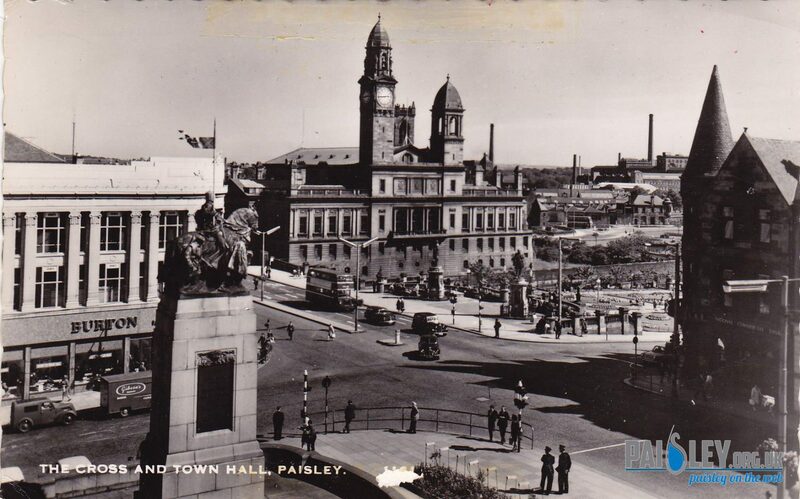 If you would like to see more Paisley History please keep coming back whilst we update the history sections. To discuss Paisley History join us on our Facebook Group.